Howdy, forex friends! If you’re looking for top-tier reports that may allow you to pillage some quick pips from the Loonie before the week ends, then heads up ‘coz Canada will be simultaneously releasing its CPI and retail sales report this Friday at 1:30 pm GMT. And as always, I have another edition of my Event Preview. You better read up, eh? Canada’s inflation situation in September was rather disappointing since headline CPI fell by 0.4% month-on-month contrary to expectations for a flat reading. Also, the decline in September is the worst reading in nine months and marks the second consecutive month of negative readings. The year-on-year reading, meanwhile, eased from +2.8% to a four-month low of +2.2%. The market was only expecting a slightly weaker 2.7% increase. Worse, all three of the BOC’s preferred measures for the core reading weakened for the first time since November 2016. And looking at the details, the weakness was broad-based since 5 of the 8 CPI components printed weaker readings on both a monthly and annual basis. To sum it all up, the September CPI report was disappointing on the surface and the details only added to the disappointment. 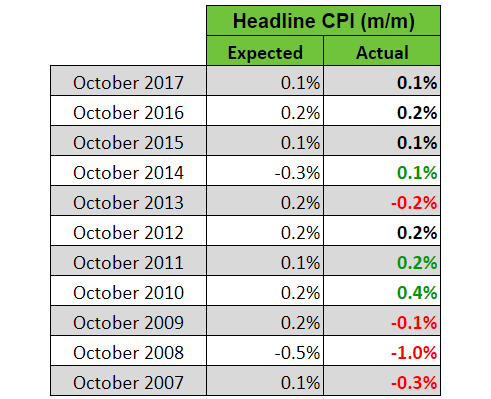 Most economists forecast that headline CPI recovered slightly by 0.1% month-on-month in October after declining by 0.4% back in September. The year-on-year reading, meanwhile, is expected to maintain the previous month’s annual pace of +2.2%. The prices index of the Ivey PMI report jumped from 68.8 to 72.6 in October, which means that input costs increased at much faster rate. That doesn’t automatically translate to higher CPI, though. There are more instances where the October reading has been weaker compared to the September reading, but that historical pattern is not very strong, especially in recent years. And looking at how economists fared with their guesstimates, there’s no clear historical tendency to exploit, but it’s worth noting that economists have been getting it right in the last three years. To summarize, there’s a consensus that the monthly CPI reading recovered in October, which is supported by the available leading indicators. As for historical tendencies, there are no meaningful trends for us to take advantage of. Heck, economists have been right on the money with their guesstimates in the past three years, so probability appears to be balanced, based on historical data. However, I wouldn’t be too surprised if the actual reading is better-than-expected. After all, the available leading indicators do support a stronger reading for October. Canada’s August retail sales report was rather disappointing since it revealed that retail sales fell by 0.1% month-on-month, contrary to expectations for a 0.3% increase. Moreover, the previous reading was revised lower from +0.3% to +0.2%. The core reading also failed to meet expectations since it printed a 0.4% slide. The market was expecting a 0.1% rise. And like the previous headline reading, the previous core reading was also revised lower from +0.9% to +0.8%. And according to the details of the report, 7 of the 11 retail store types reported weaker sales while vehicles sales recovered by 0.8%, which is why the core reading took a much bigger hit. In summary, the August retail sales report was pretty bad and the details only showed that the weakness was broad-based, which is also bad. For the upcoming retail sales report, the general consensus is that headline retail sales increased by 0.1% in September, while the core reading is expected to print a 0.3% increase. In other words, there is a consensus for a recovery. Moreover, there’s an implies consensus that non-vehicle sales will drive the recovery in retail sales since the core reading is expected to print a stronger increase. Canada’s September jobs report showed that the wholesale and retail trade industries added 11.5K jobs. The October jobs report also showed that the wholesale and retail trade industries added an additional 19.3K jobs, which may be a sign that business conditions may have been good. Canada’s August trade report revealed that imports of motor vehicles and parts increased by 2.22% (-2.97% previous). The trade report also showed that imports of consumer goods increased by 2.81% (-2.67% previous). Comparing the readings for August and September, there are more instances of weaker core readings in September but the opposite holds true for the headline reading. As to how economists fared with their guesstimates, economists used to be too pessimistic with their guesstimates for the headline reading. However, they now appear to be too optimistic since there are more downside surprises in recent years. In fact, the headline readings in the last three years were all downside surprises. As for the core reading, it’s quite clear that economists have a strong tendency to overshoot their guesstimates. To summarize, there’s a consensus that retail sales recovered in September. This consensus view is supported by the available leading indicators and related reports. Historical tendencies support the consensus view for a stronger headline reading, but the same can’t be said for the core reading. Furthermore, economists have a strong tendency to overshoot their guesstimates for the core reading and a not-as-strong tendency to overshoot their forecasts for the headline reading, which skew probability more towards a potential downside surprise for both the headline and core readings. However, just keep in mind that we’re playing with probabilities here, so there is always a possibility that both headline and core readings may surprise to the upside. And remember, the available leading indicators and related reports are pointing to potentially stronger retail sales growth in September. Canada’s retail sales and CPI reports will be released simultaneously. And if both top-tier reports surprise to the upside, then that usually triggers a quick Loonie rally. Conversely, if both reports fail to impress, then the Loonie will likely get a bearish quick. And the Loonie’s bearish reaction to the previous reports is a classic example of this. But if the readings are mixed, then its the CPI report that usually (but not always) takes precedence, with the headline month-on-month reading usually in focus. However, follow-through buying or selling usually depends on oil prices, so make sure to keep an eye on oil prices as well. And if you didn’t know, you can check out oil prices at our Live Market Rates page.